Some news and views from the world of geoscience this last fortnight. If you ever wanted to get into open source geospatial software but didn't know where to start, check this out. Last month OSGeo, the open source geospatial foundation, released version 5 of their OSGeo-Live project. This is a bootable disk image containing 47 pieces of free software, including several full GIS, world maps, and quick-start guides. Amazing! 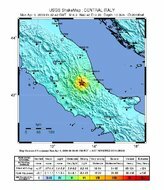 The L'Aquila earthquake of April 2009 killed 308 people. Six seismologists are now on trial for manslaughter, not so much because they failed to predict the quake, but because they allegedly downplayed the risk of a severe event. Most geoscientists believe that we cannot predict earthquakes today; these seismologists are effectively accused of trying to predict a non-earthquake. We don't know, but suspect their intent was misinterpreted—always a danger when specialists communicate with non-specialists. There is no daily coverage of the trial that we are aware of, but there are occasional reports in the press. In this short video, Giustino Parisse explains why he is one of the plaintiffs. 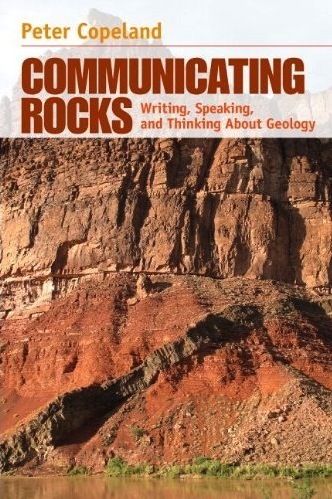 If you're new to blogs—maybe you got a tablet recently and are discovering how easy it is to read the web these days—you might not be aware that there's a lot of geology in the blogosphere. Finding writers you want to read isn't easy though. You could scroll down this page and look for our BLOGROLL for some leads, or head over to Highly Allochthonous and read the latest Accretionary Wedge, a regular meta-post. This month: practical advice for the lifelong learner. We recently learned of this terrific new book from University of Houston professor Peter Copeland (thanks to his colleague, Rob Stewart, for the tip!). We haven't actually got our hands on it yet, but the Amazon preview has whet our appetites for geo-communication tips galore. The publisher, Prentice Hall, has kept the price to a reasonable amount, close to $35. Get your copy now! This regular news feature is for information only. We aren't connected with any of these organizations, and don't necessarily endorse their products or services. Public domain map image from the USGS. Day 3 of the SEG Annual Meeting came and went in a bit of a blur. Delegates were palpably close to saturation, getting harder to impress. Most were no longer taking notes, happy to let the geophysical tide of acoustic signal, and occasional noise, wash over them. Here's what we saw. I (Evan) loved Gilles's talk Interpretive noise attenuation in the curvelet domain. For someone who is merely a spectator in the arena of domain transforms and noise removal techniques, I was surprised to find it digestable and well-paced. Coherent noise can be difficult to remove independently from coherent signal, but using dyadic partitions of the frequency-wavenumber (f-k) domain, sectors called curvelets can be muted or amplified for reducing noise and increasing signal. Curvelets have popped up in a few talks, because they can be a very sparse representation of seismic data. Speaking of exotic signal decompositions, Ru-Shan Wu, University of California at Santa Clara, took his audience to new heights, or depths, or widths, or... something. Halfway through his description of the seismic wavefield as a light-cone in 4D Fourier time-space best characterized by drumbeat beamlets—or dreamlets—we realized that we'd fallen through a wormhole in the seismic continuum and stopped taking notes. Lev dished a delicious spread of tidbits crucial for understanding the geomechanical control on hydraulic fracture stimulations. It's common practice to drill parallel to the minimum horizontal stress direction to optimize fracture growth away from the well location. For isotropic linear elastic fracture behaviour, the breakdown pressure of a formation is a function of the maximum horizontal stress, the vertical stress, the pore pressure, and the fracture toughness. Unfortunately, rocks we'd like to frack are not isotropic, and need to be understood in terms of anisotropy and inelastic strains. Lastly, we stopped in to look at the posters. But instead of being the fun-fest of awesome geoscience we were looking forward to (we're optimistic people), it was a bit of a downer and made us rather sad. 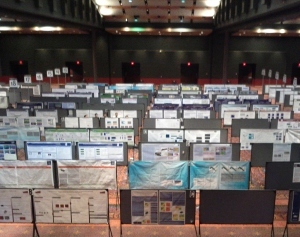 Posters are often a bit unsatisfactory for the presenter: they are difficult to make, and often tucked away in a seldom-visited corner of the conference. But there was no less-frequented corner of San Antonio, and possibly the state of Texas, than the dingy poster hall at SEG this year. There were perhaps 25 people looking at the 400-or-so posters. Like us, most of them were crying. More posts from SEG 2011. This is the last in a series of posts about some stamps I bought on eBay in May. I don't collect stamps, but these were irresistible to me. They are 1980-vintage East German stamps, not with cartoons or schematic illustrations but precisely draughted drawings of geophysical methods. 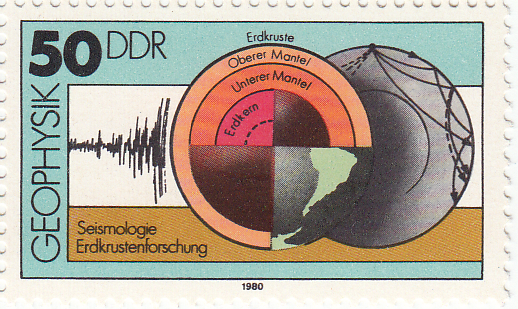 I have already written about the the gravimeter, the sonic tool, and the geophone stamps; today it's time to finish off and cover the 50 pfennig stamp, depicting global seismology. ← The 50 pfennig stamp in the series of four shows not an instrument, but the method of deep-earth seismology. Earthquakes' seismic traces, left-most, are the basic pieces of data. 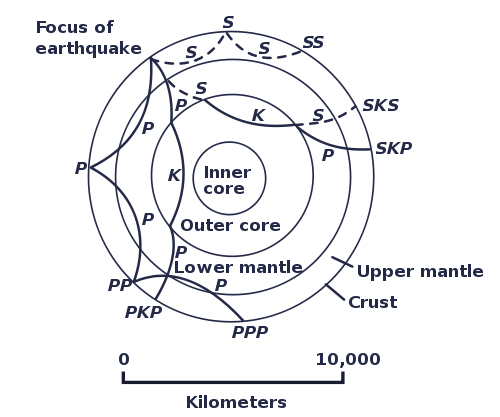 Seismologists analyse the paths of these signals through the earth's crust (Erdkruste), mantle (Mantel) and core (Erdkern), right-most. The result is a model of the earth's deep interior, centre. Erdkrustenforschung translates as earth crust surveying. The actual size of the stamp is 43 × 26 mm. The M9.2 Sumatra-Andaman earthquake of 2004 lasted for an incredible 500 seconds—compared to a few seconds or tens of seconds for most earthquakes felt by humans. Giant events like this are rare (once a decade), and especially valuable because of the broad band of frequencies and very high amplitudes they generate. This allows high-fidelity detection by precision digital instruments like the Streckeisen STS-1 seismometer, positioned all over the world in networks like the United States' Global Seismographic Network, and the meta-network coordinated by the Federation of Digital Seismograph Networks, or FDSN. And these wavefields need global receiver arrays. The basic structure of the earth was famously elucidated decades ago by these patterns of wave reflection and refraction through the earth's fundamentally concentric spheres of the solid inner core, liquid outer core, viscous mantle, and solid crust. For example, the apparent inability of the outer core to support S-waves is the primary evidence for its interpretation as a liquid. Today, global seismologists are more concerned with the finer points of this structure, and eking more resolution out of the intrinsically cryptic filter that is the earth. Sound familiar? What we do in exploration seismology is just a high-resolution, narrow-band, controlled-source extension of these methods.